As someone who spends a lot of time on airplanes, I know firsthand how important a good travel pillow can be! I have tried many travel pillows over the years, and Cabeau is by far my favorite! I have used their Evolution Cool® style for the past few years, so I was really excited when the brand's PR team provided me with an opportunity to check out their Evolution® style as well. There is meaning behind Cabeau's choice of the term 'Evolution' when naming its travel pillows, as the intent behind the line is to provide travelers with "the next evolution in comfort on-the-go." In my experience, this term describes the line really well - because they go far beyond similar products I used tried before. I tried a number of travel pillows over the years before being introduced to my first Cabeau pillow. I had such a positive experience that I quickly became loyal to the brand for travel pillows and a variety of other travel accessories (their Corepack Premium backpack is awesome!). The first thing that caught my eye about the Evolution Cool® style is its unique design. Rather than being the traditional travel pillow style that retains its shape all the time, this pillow is designed to be rolled up and zipped away inside a pouch that can easily be clipped to a backpack or other piece of luggage. Having lost more than one travel pillow over the years, this is a great feature for someone like me. The compact size doesn't limit the functionality of this pillow, though. 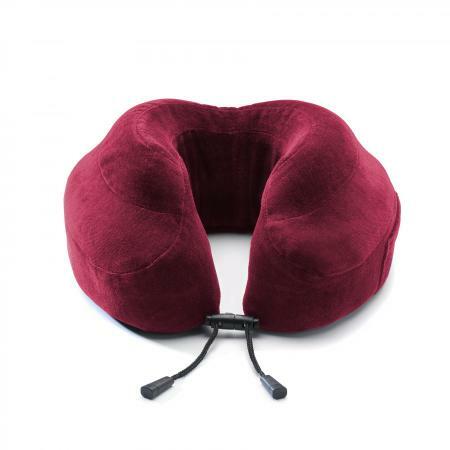 Even though its shape is different than traditional travel pillows, it does a great job providing a bit of cushion during long hours in-flight or otherwise on the go. It is made of memory foam, which is why it can provide maximum support and comfort in a compact package. The design is made from a smooth (as opposed to plus) fabric in a design that features built-in cooling events to keep things from feeling stuffy while you're using the pillow. I find this to be a real plus for air travel since planes can get super-warm. Additionally, the pillow's unique design that wraps all the way around and has an adjustable cinch to provide customized 360-degree support for your head and neck. I have used this pillow on numerous flights, including coast-to-coast routes. It is by far my favorite travel pillow for flying. I highly recommend it to anyone who is looking for a minimal, easily packable pillow that delivers maximum comfort. As an added bonus, it comes with memory foam ear plugs. I have not had the Evolution® pillow for as long as the Evolution Cool® style, but my experience with it has also been quite positive. Its design is very different, though there are some similarities between the two styles. This is a larger pillow than the Evolution Cool®, which means that it is ideal for people who prefer a thick, plush pillow to one that is more compact. The company bills it as "the most comfortable travel neck pillow on the market," and it's easy to see why as soon as you rest your head on it. This pillow looks more like a traditional travel pillow design than Evolution Cool®, but you shouldn't let that fool you. It is absolutely not a typical travel pillow. It is made with responsive memory foam, so it provides terrific support and cushioning. The design is ergonomic, providing a flat area in the back so it fits against your neck without pushing your head into an unnatural position. It has the same adjustable cinch closure as the other style, which means you can adjust it for a custom fit that provides the ideal level of 360-degree head and neck support. The Evolution® pillow comes with a carrying case that you can use to transport the pillow throughout your travels. You can use the case to compress the pillow to a shrink down to one-quarter of its size, which means you can easily toss it in a small corner of your luggage. You shouldn't store it in a compressed state long-term, though. This style also comes with a set of memory foam ear plugs. I have not yet taken this pillow on an airplane trip, though have used it when riding as a passenger for approximately seven hours. It was quite comfortable, and helped to effectively protect and cushion my head and neck during those inevitable road trip naps. In addition to the two styles discussed in this review, Cabeau's pillow collection also includes Evo Microbead™ and Air Evolution® styles. As the names suggest, one is filled with microbeads and the other is an air pillow. 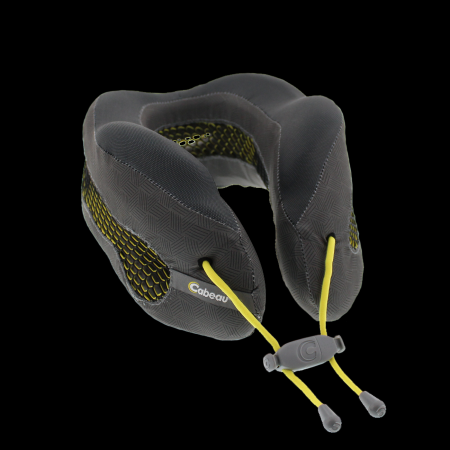 Both feature Cabeau's unique cinch closure for 360-degree support of the head and neck. I have not had an opportunity to try them for myself, but there are a favorable reviews online for both the Microbead and Air styles. I will probably continue to use the Evolution Cool® style for air travel due to the fact that it I love being able to keep its zip-up case clipped to my backpack at all times. I enjoy this pillow so much that I would simply purchase another one to use if I lost the one I have now without even shopping around for alternatives. However, it seems that Evolution® is quickly becoming my go-to choice for road trips where I'll spend quite a bit of time riding as a passenger. Both styles are great choices that I highly recommend for anyone who is looking to stay comfortable when traveling. Choosing the one that works best for you is simply a matter of how you will use it and what kind of pillow you prefer. Note: The author received a sample pillow from Cabeau at no cost for this independent review. The opinions shared here are her own.